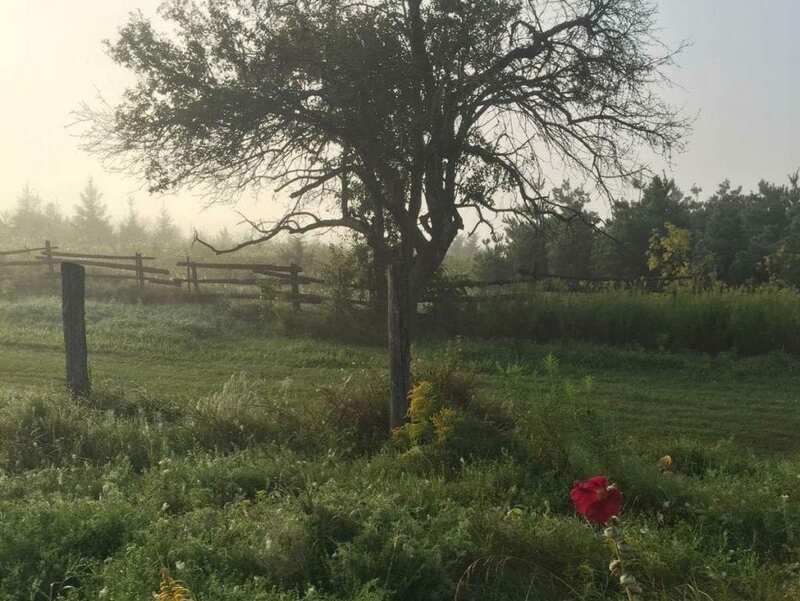 This exquisite 1860 renovated farm housed is situated on over 100 acres of ecologically diverse land. 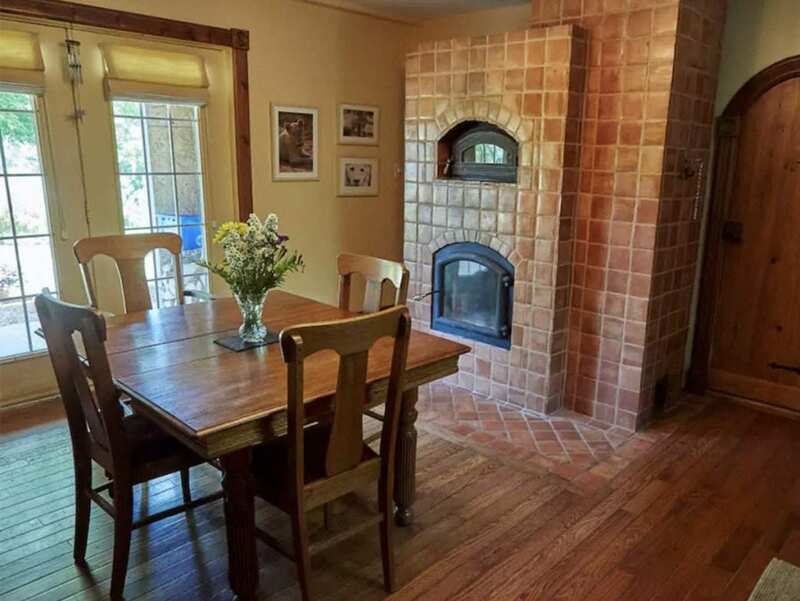 It comes with a full amenities kitchen and a spectacular masonry. 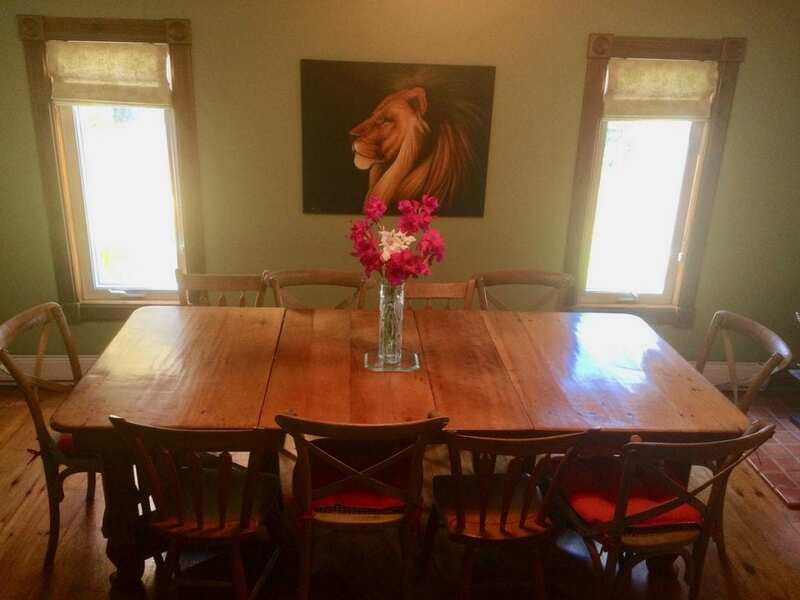 The dining area has a large pine harvest table easily accommodating 6 - 12 people. 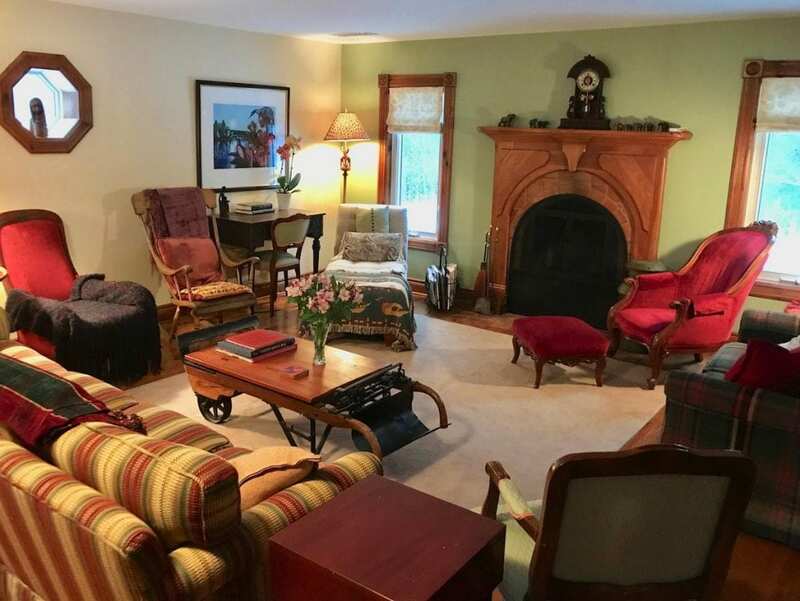 The living area complete with comfortable sofas and chairs has a wood stove and fully operational fireplace. There are six bedrooms; one on the main floor near the front entrance and five on the second floor. 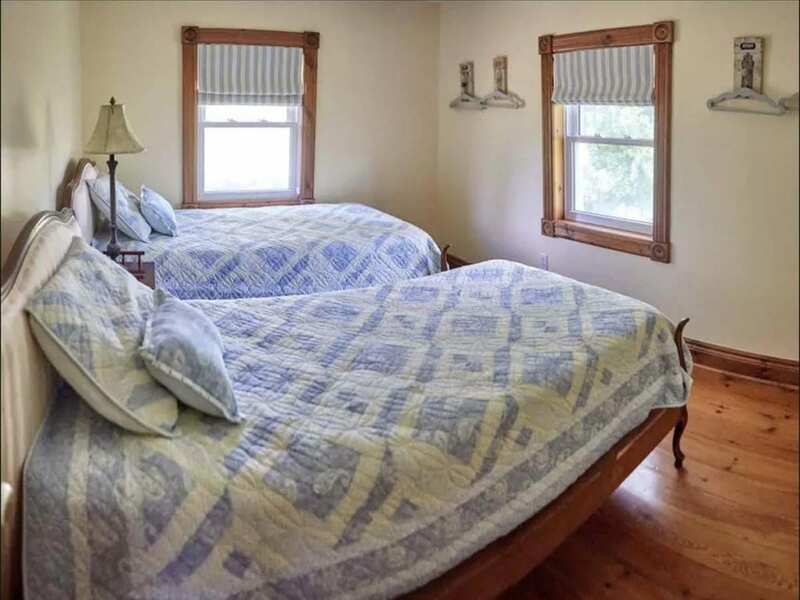 The main floor bedroom has a double bed. 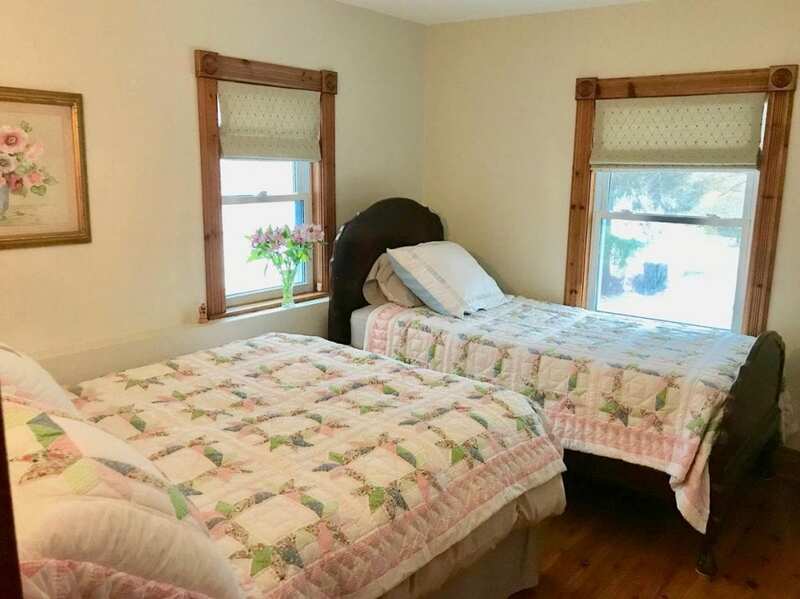 The bedrooms on the second floor include: one with a queen bed, one with a double bed, one with a single and double bed, and two bedrooms with two twin beds in each (9 beds in total in the farm house). New baseboard heating has been put in the bedrooms to ensure people are warm on cold nights. There are two fully equipped bathrooms. Additional sleeping is available in the cabins as noted below. The outdoor patio has a table, chairs and BBQ. There is ample room to park vehicles. Bicycles can be stored in the workshop barn. 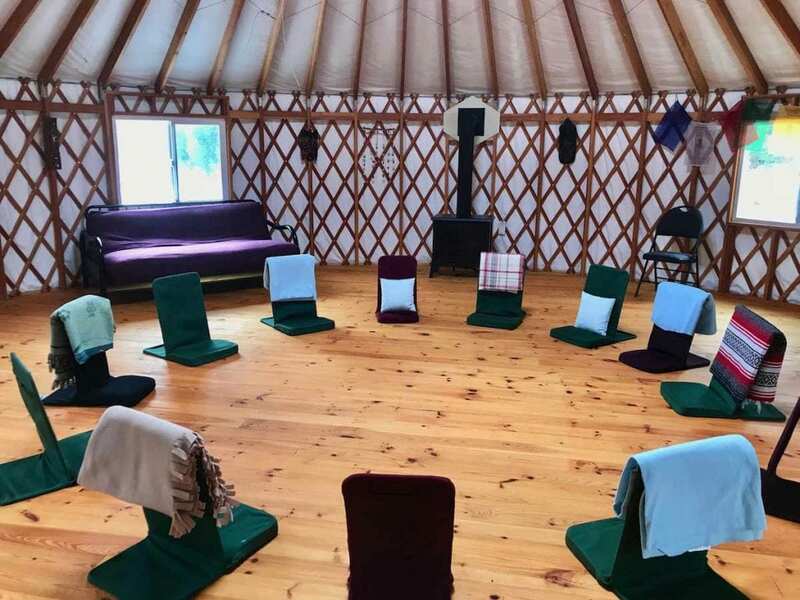 There is a 30-foot diameter yurt with pine floors perfect for circles, yoga, tai chi, dance and the arts. It is situated in the valley about 1/2 km from the farmhouse. A propane stove provides heat in cooler months. 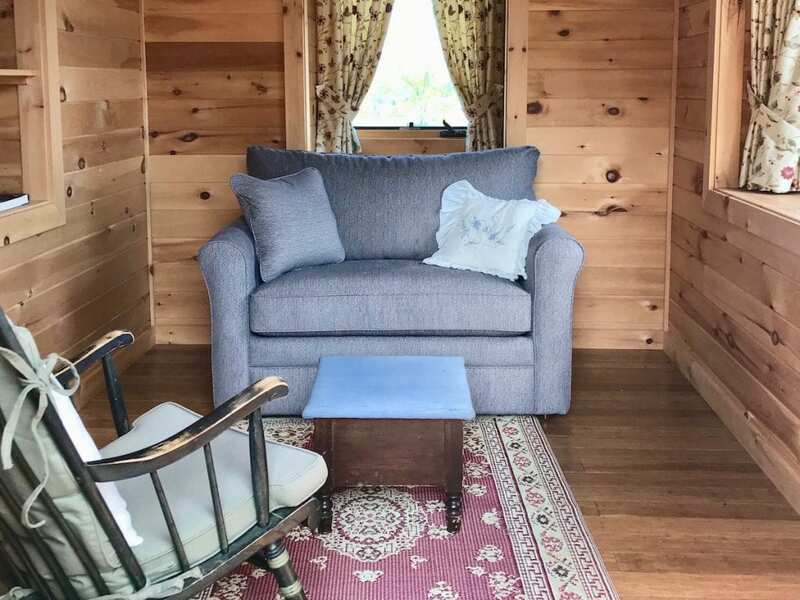 Haven on the Hill-Top is an enchanting cabin with magnificent views of the hills & valleys of Northumberland. 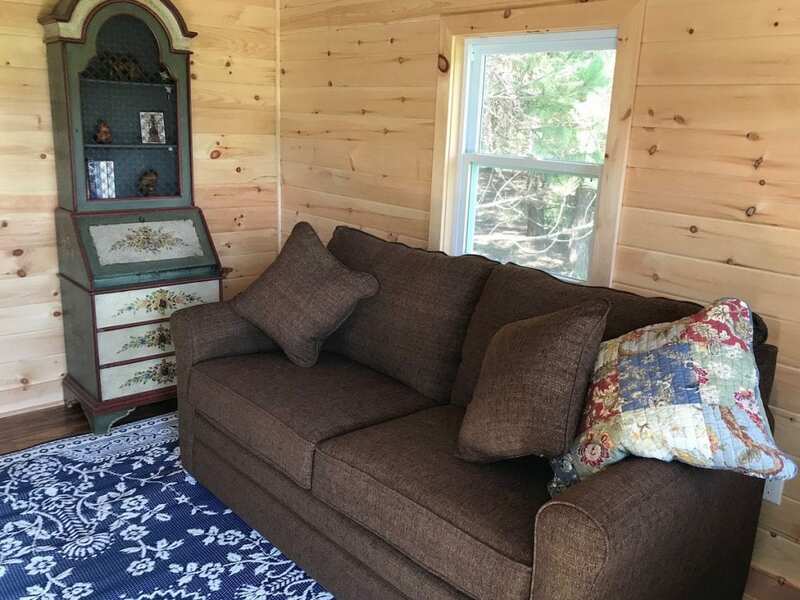 A perfect sanctuary, it has a seating area on the main floor which includes an twin and 1/2 sofa bed. In the loft there is a double mattress. 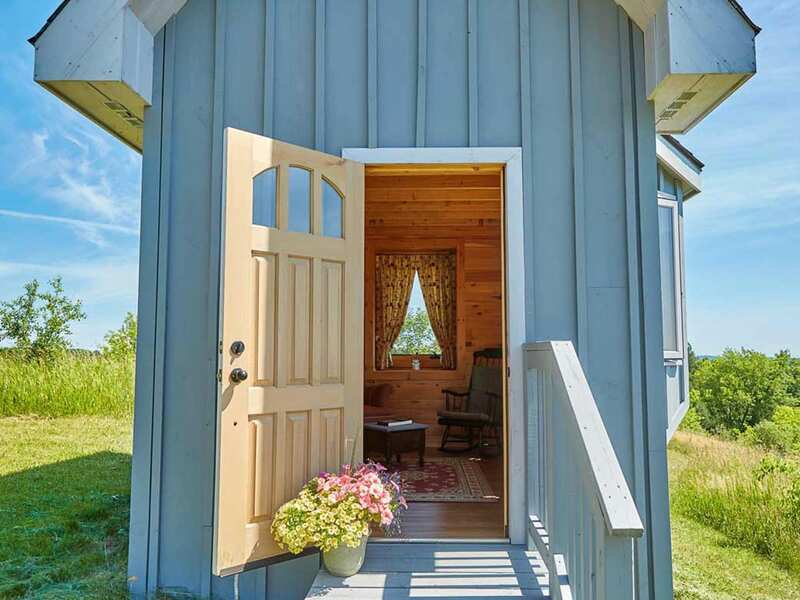 There’s an upscale outhouse near the cabin. Also on this hill overlooking the valley is the stone labyrinth. 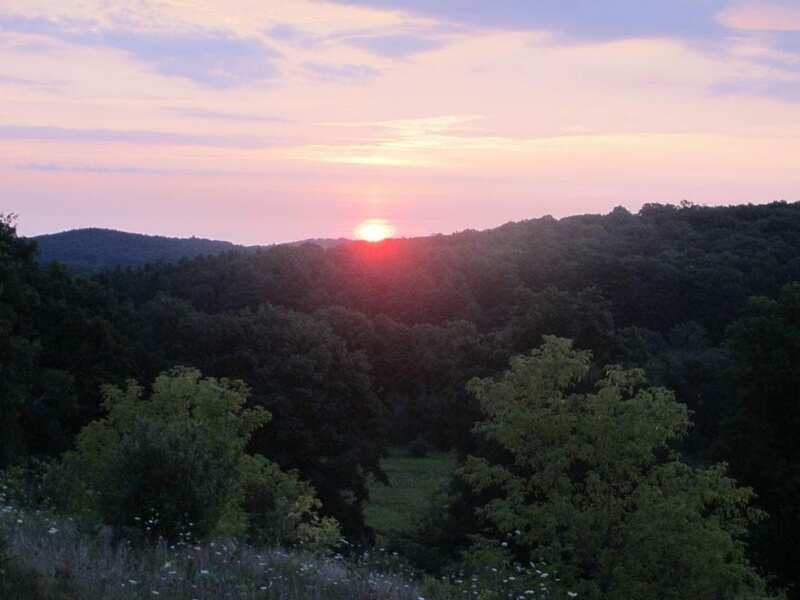 This cabin is on the first hill approximately a 15 minute walk from the farm house. 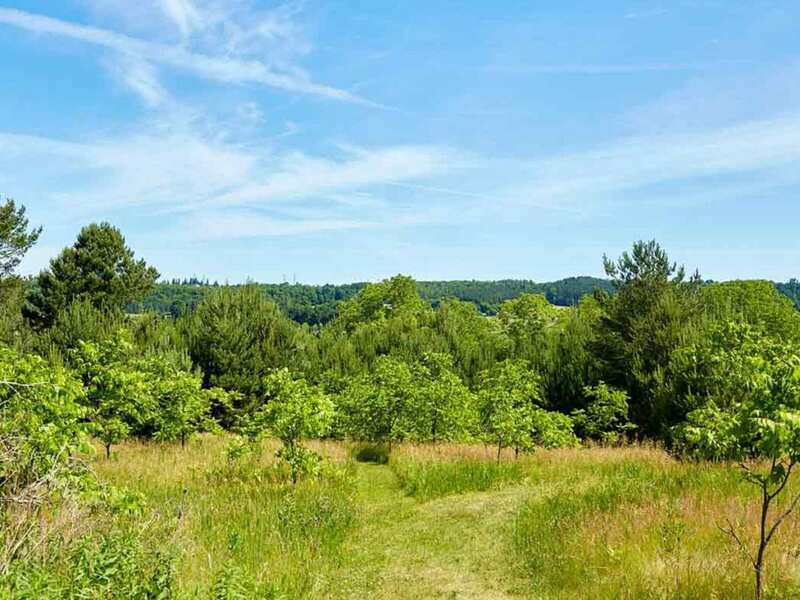 Haven in the Meadow (available as of late May, 2018) is located on the meadow’s edge nestled in the whispering pines. The main floor includes a double sofa bed and writer’s desk. A queen mattress is in the loft. Nearby there’s an outhouse with a pedal toilet. 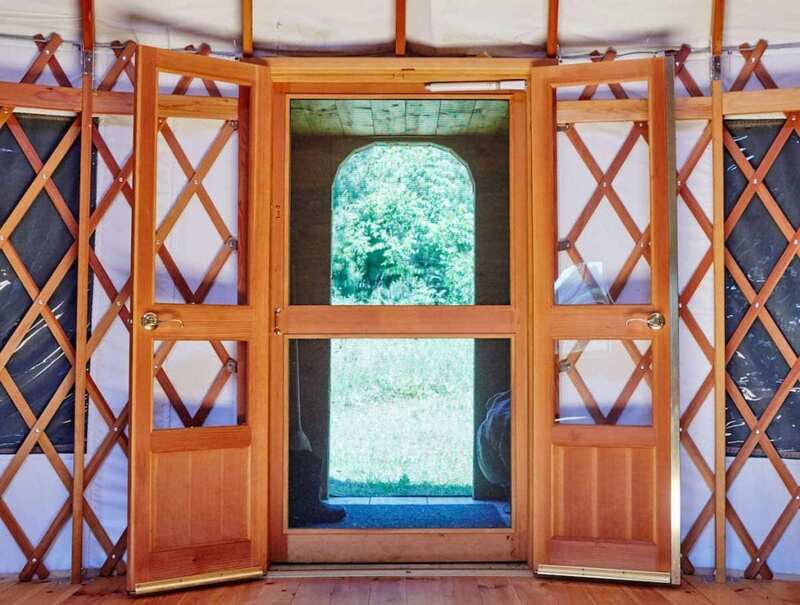 The cabin is close to the yurt and is approximately a 5 - 10 minute walk from the farm house. Ideal for people wanting to be “in retreat”. We are keen to attract and host like minded/hearted people committed to making a difference in our world. Access to shared common space which includes the farm house kitchen, living and dining area, bathrooms and the yurt. 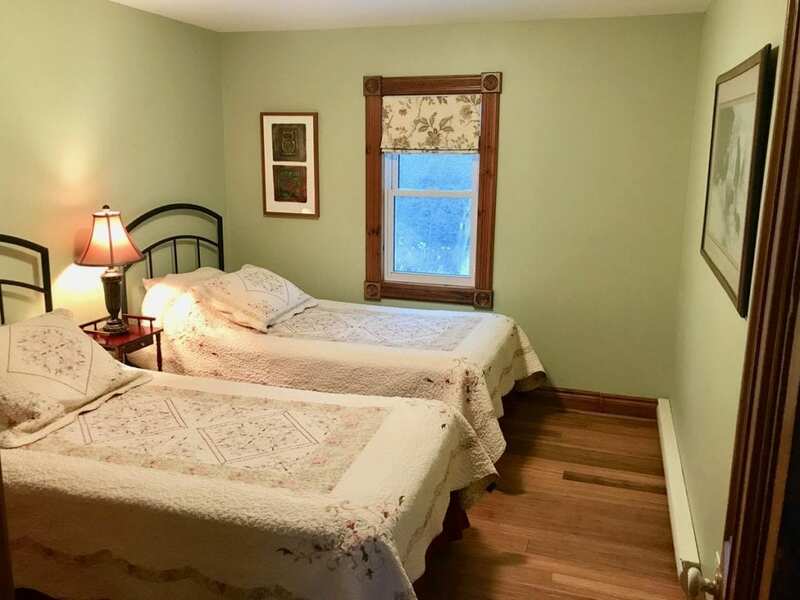 We open a limited number of farm house rooms and cabins to support privacy. When more than one room or cabin is booked we ask for people to be in silence or whispering voices when in common space unless agreed upon with other guests. Availability is usually week days/nights from Monday - Thursdays with a minimum 2 nights unless otherwise arranged. Meals are not included. 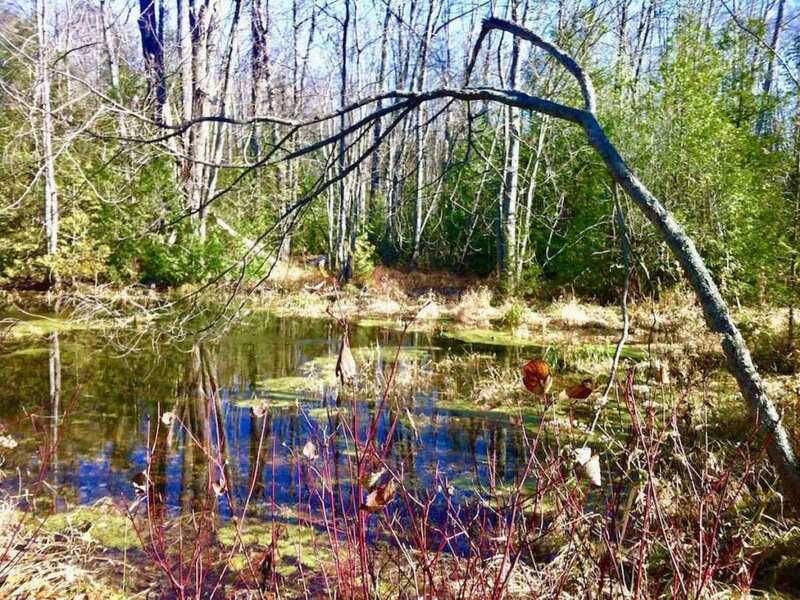 Haven in the Meadow (available as of late May, 2018) is located on the meadow’s edge nestled in the whispering pines. The main floor includes a queen sofa bed, comfortable chair and writer’s desk. A double mattress is in the loft. Nearby there’s an outhouse with a pedal toilet. 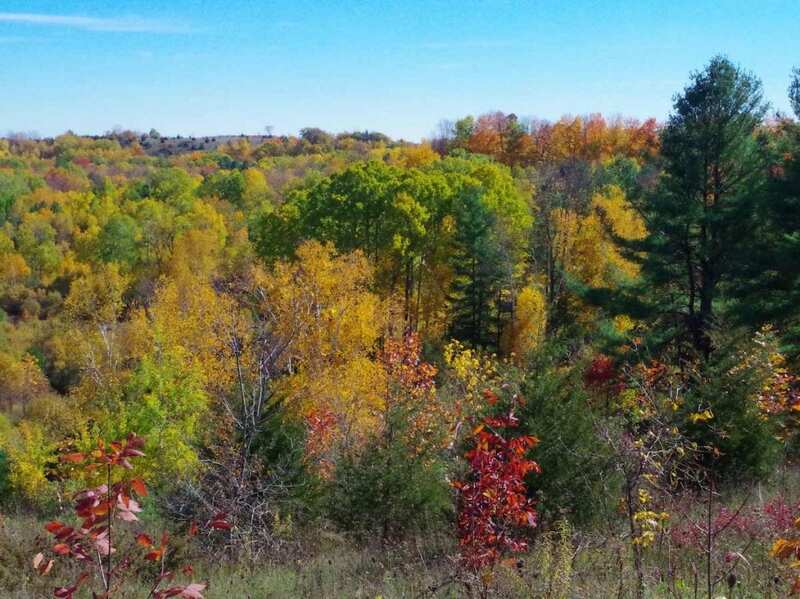 The cabin is close to the yurt and is approximately a 5 - 10 minute walk from the farm house. The Mystic Room with cathedral ceiling and queen bed is south facing on the second floor of the farm house. 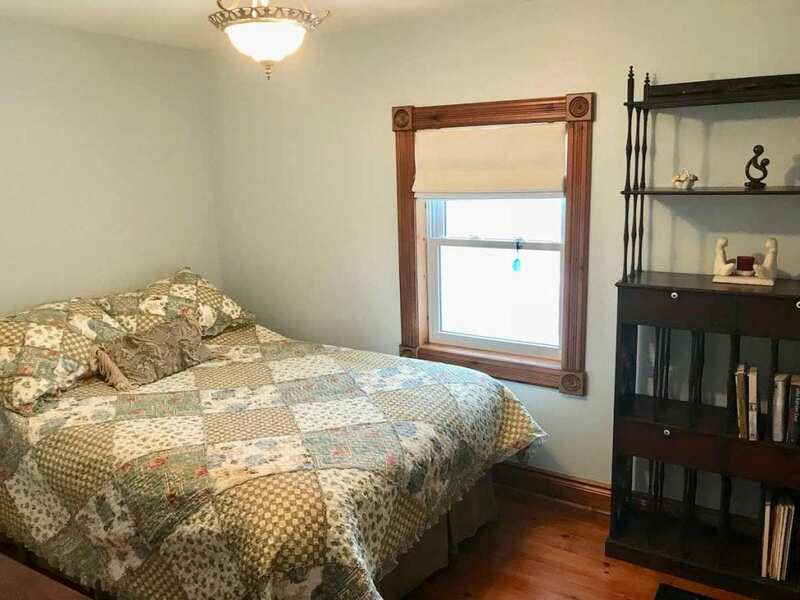 It has large cupboards, a dresser and a chair. There is a full amenities bathroom right next to it. You'll have access to a fully equipped kitchen, bathrooms, cozy living and dining areas. This is a magnificent place for singles or couples wanting to be in retreat. It’s also a terrific place for solo adventurers or business travellers. The Sage Room is located on the main floor close to the front entrance. 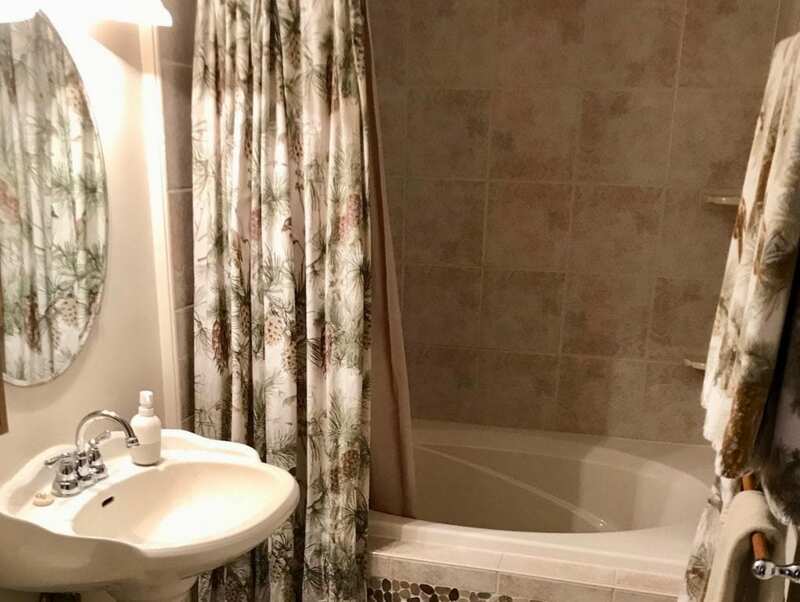 It has a double bed and is next to a full amenities bathroom. You have access to welcoming, cozy living and dining areas and a fully equipped kitchen. In order to support access to individual retreats we have designated dates on the calendar for people to book sleeping accommodations while having the use of shared common spaces. 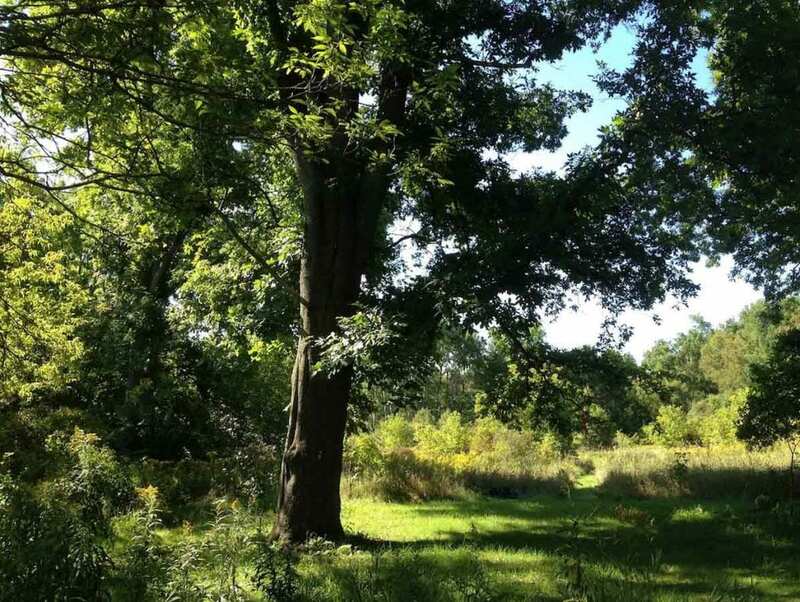 Over 100 acres of ecologically diverse land & trails through meadows & forest. Guests are requested to be in silence while in common areas unless agreed upon with each other. 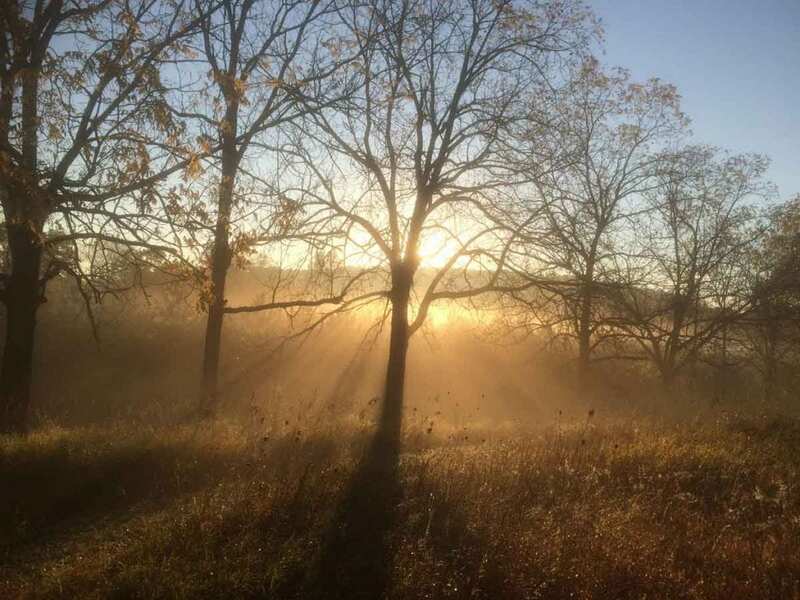 Ideal for retreat, meditation, connecting with nature, writers or other artists. 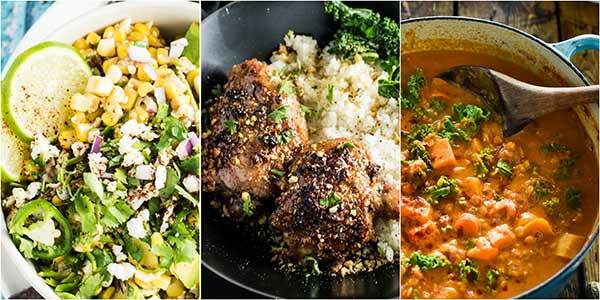 Scrumptious, healthy, home made meals are often part of the group retreats/workshops offered by Fells Meadows. We are committed to doing our best to meet diverse needs (vegetarian or gluten free) when requested. Whenever possible we source organic foods locally, including our own on-site vegetable, fruit and herb gardens. Groups renting accommodations usually provide their own meals. Please enquire if your group would like to book a cook or catering. We’ll do our best to arrange meal services if the cook is available. Please contact Fells Meadows for prices and availability of a cook or catering. There is a VIA train stop in Cobourg. We can provide you with a taxi list or we offer a pick up and return service for a fee of $75. Leslie Fell offers mentoring sessions and retreats. 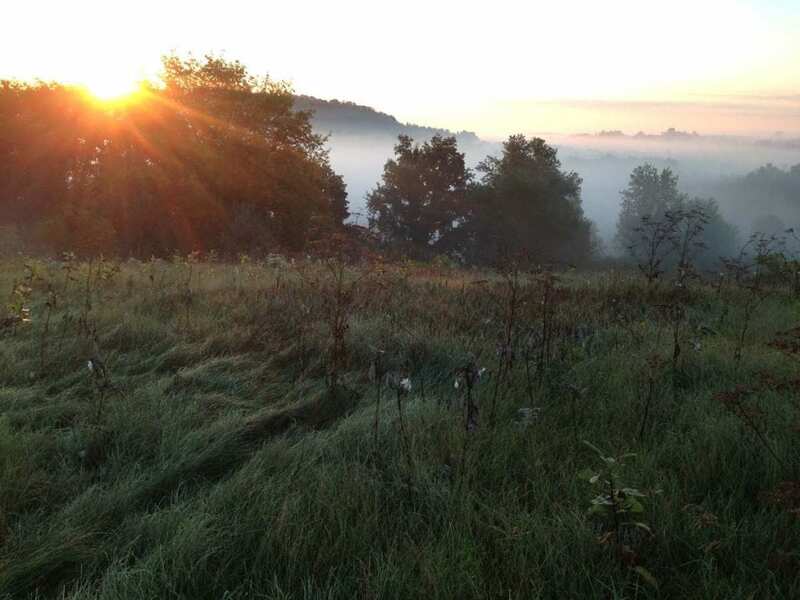 Each retreat includes private accommodations, nourishing home cooked meals, access to the Farm House, and up to 2 hours of facilitation per day. 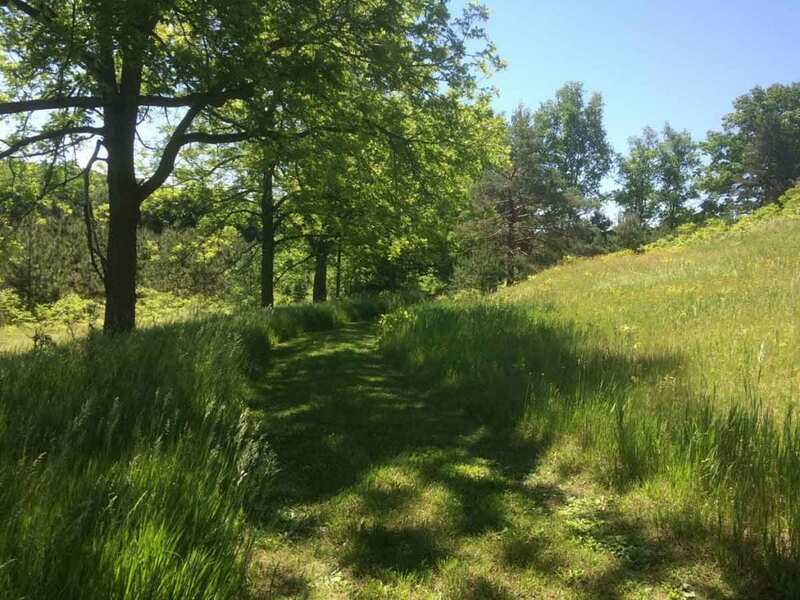 You also have access to the trails throughout over 100 acres of hills, valleys and forests and the Chartres Labyrinth. Please contact Fells Meadows for details. 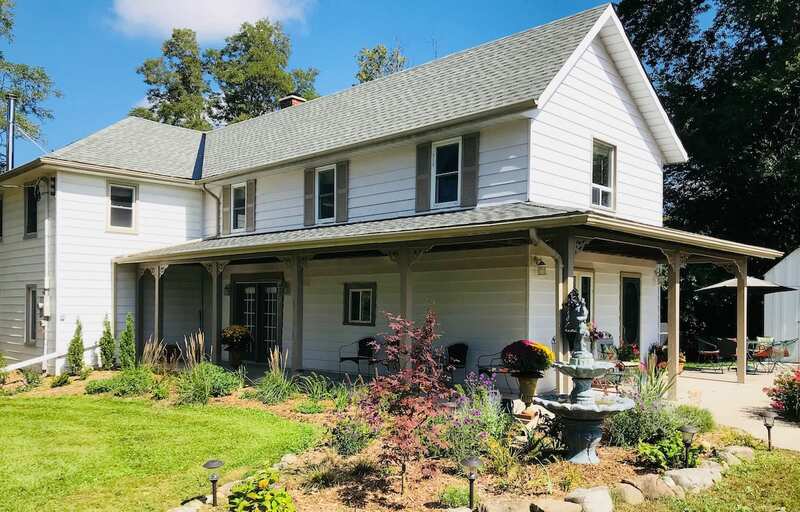 This exquisite 1860 renovated farm house situated on over 100 acres of ecologically diverse land (trails throughout) is ideal for “retreat" and close to attractions in nearby villages & cities (just over an hr East of Toronto). 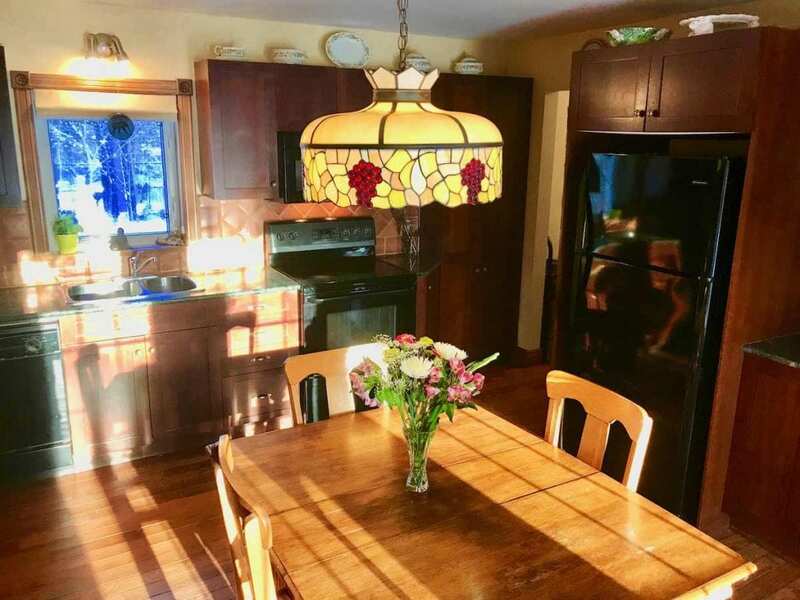 This is a magnificent space to rent for short or extended periods of time for individuals, families, colleagues or small groups seeking time in a private fully amenities house and/or in nature. Bookings of 4 nights or more are eligible for a 10% discount off base rate of the farm house. For larger groups and/or longer bookings please contact Fells Meadows. 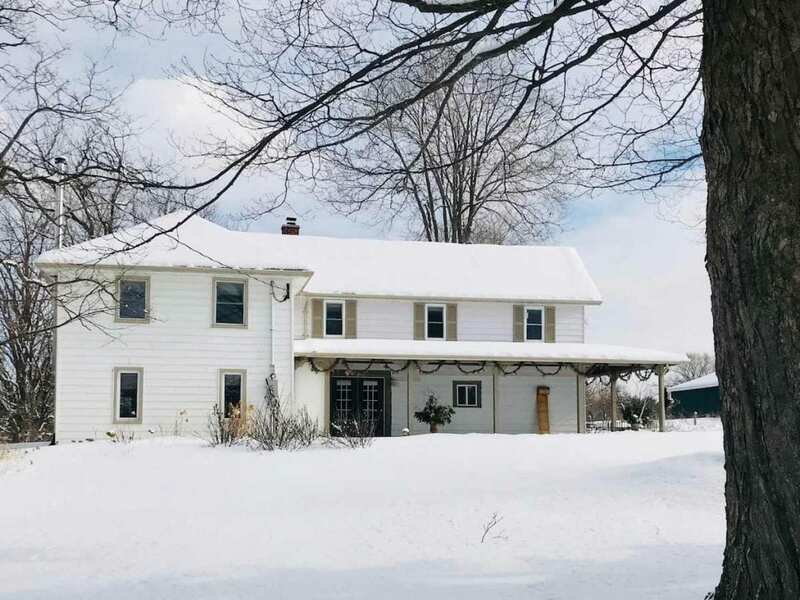 Farm House- Base Rate $410 / night for up to 6 guests then supplemental fee of $60./night/additional guest staying in the farm house or yurt. Ideal for individuals or couples wanting to be “in retreat”. We are keen to attract and host like minded/hearted people committed to making a difference in our world. Access to shared common space which includes the farm house kitchen, living and dining area, bathrooms and the yurt. 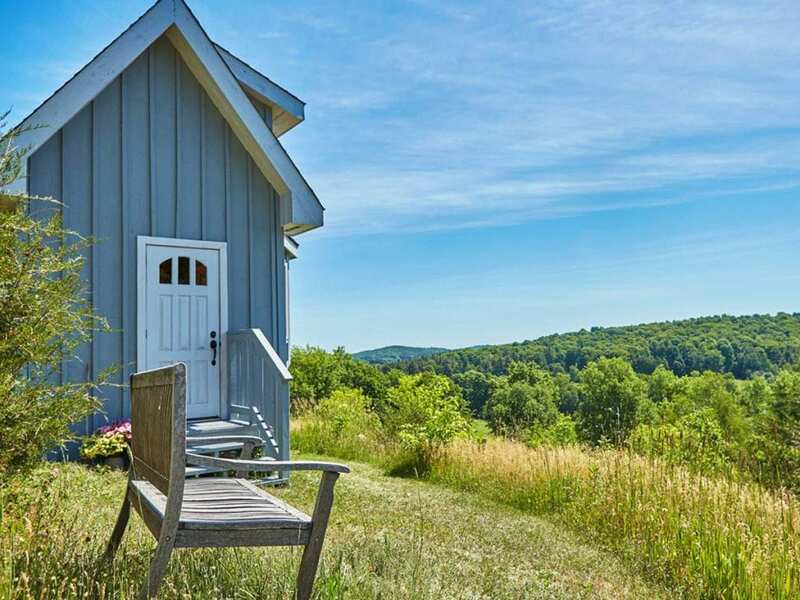 We open a limited number of farm house rooms and cabins to support privacy. Availability is usually week days/nights from Monday - Thursday with a minimum 2 nights unless otherwise arranged. Meals are not included. Rates include up to 2 guests. Minimum 2 nights. For holiday season or long weekends there is a minimum booking requirement for 3 nights. Harvest table in dining area accommodates 6 to 12 people. There is an additional table for use if needed. A spectacular masonry in the kitchen. 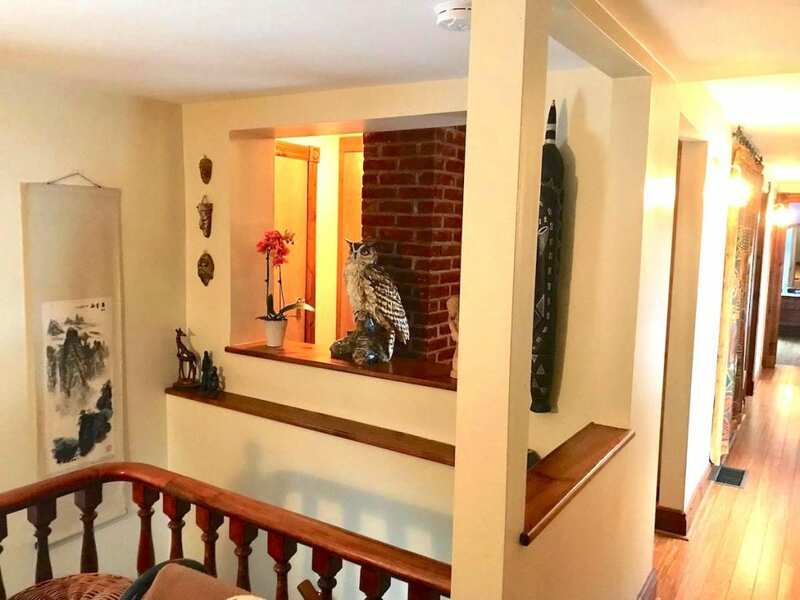 Stairwell to the second floor. The Mystic bedroom, south facing with a queen bed overlooking the gardens. The green bedroom with twin beds and armoire. 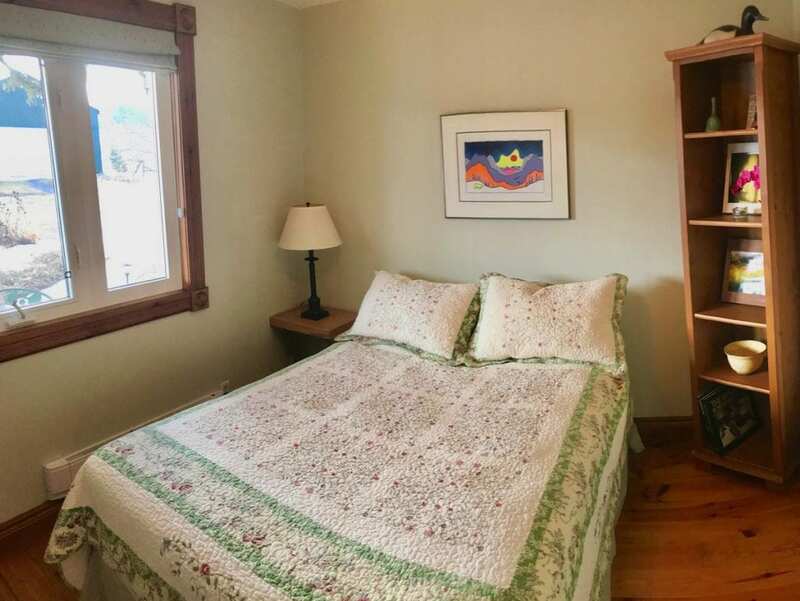 Country quilts or duvets on all of the beds. The peaceful blue bedroom with double bed, dresser and shelf. 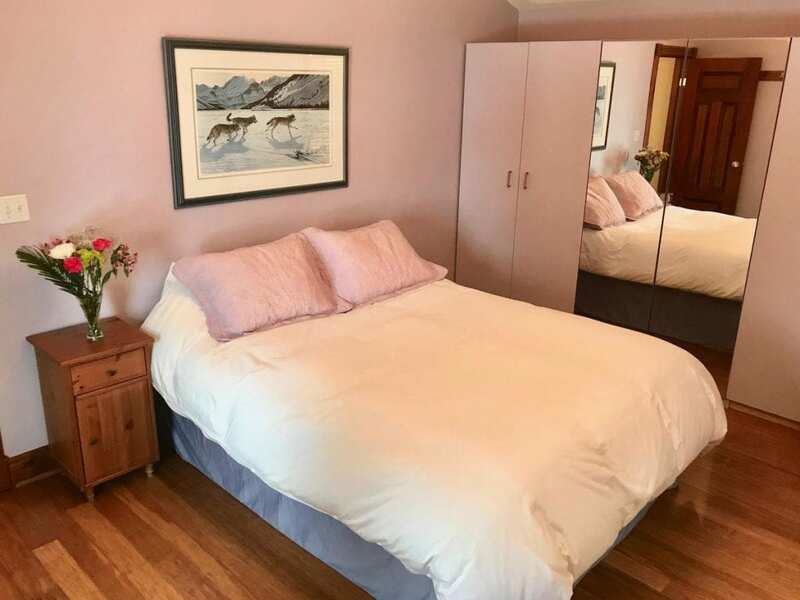 Main floor Sage bedroom with double bed, next to main floor bathroom. 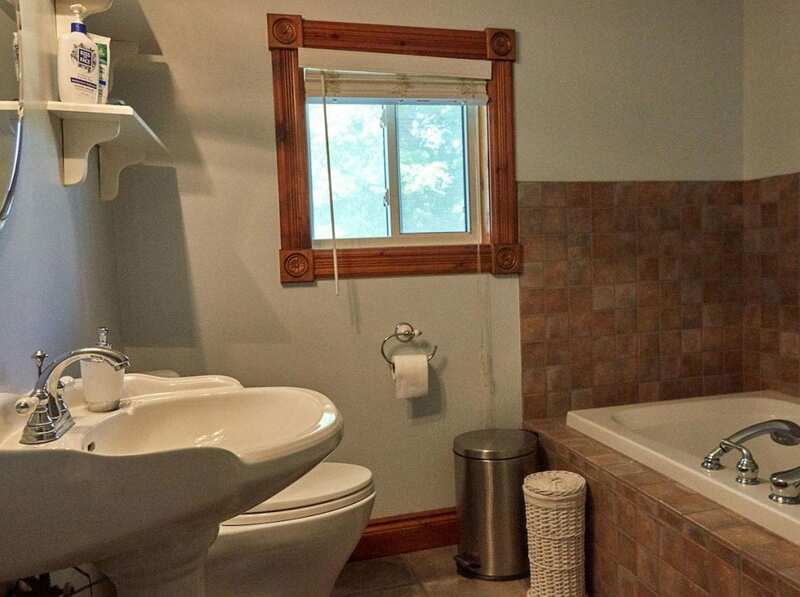 Second floor 4 piece bathroom. Winter view of the farmhouse. Welcome to the Haven on the Hilltop. 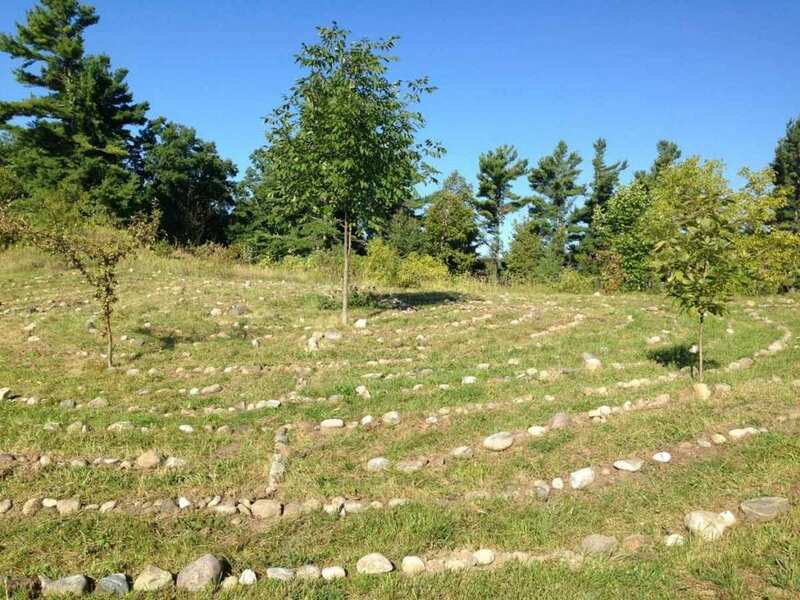 The outdoor stone labyrinth modeled after the labyrinth in Chartres, France. Ideal for meditation. Haven on the Hilltop overlooks the hills and valleys of Northumberland. The main floor of Haven on the Hilltop. An endearing place to meditate, write and find peace. Looking over the valleys and hills from the bay window in Haven on the Hilltop. 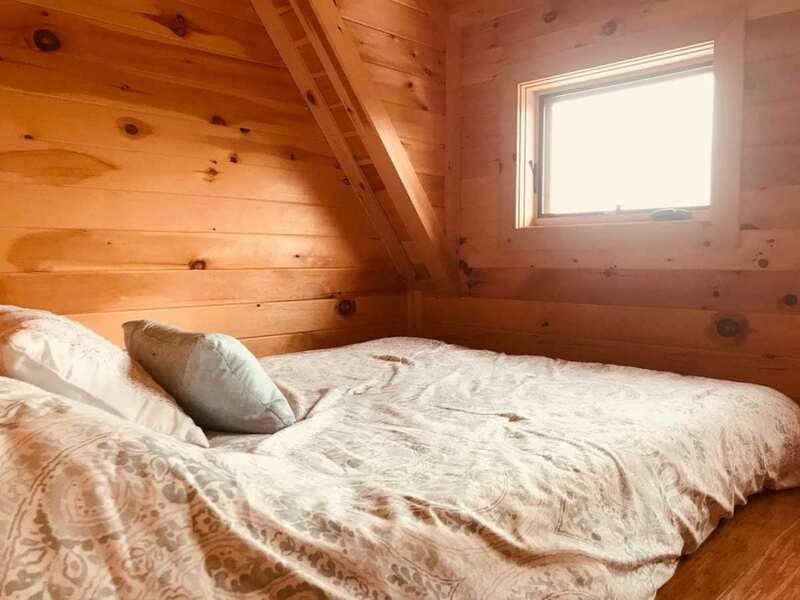 Upstairs loft with double mattress in the Haven on the Hill-top. 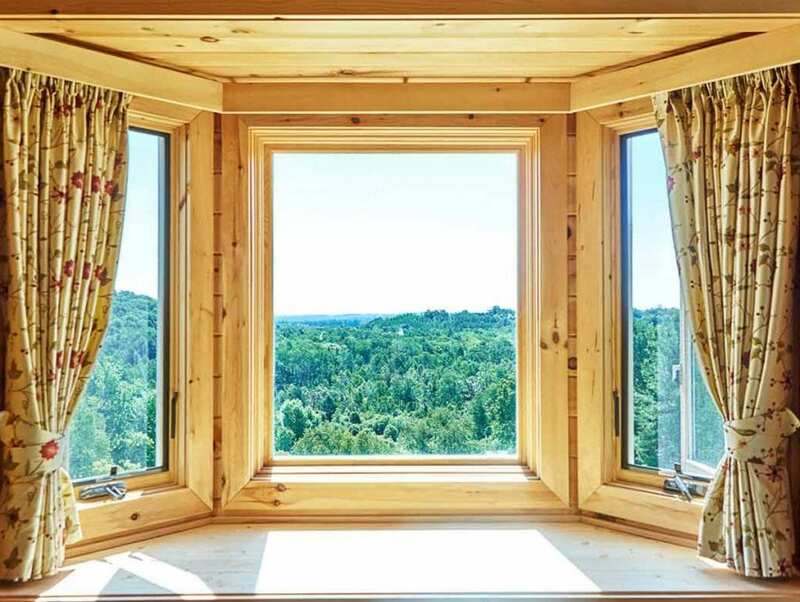 The two windows in the loft enable you to enjoy the soft breeze usually present on the hill. A comfortable double sofa bed and secretarial are on the main floor of Haven in the Meadow. 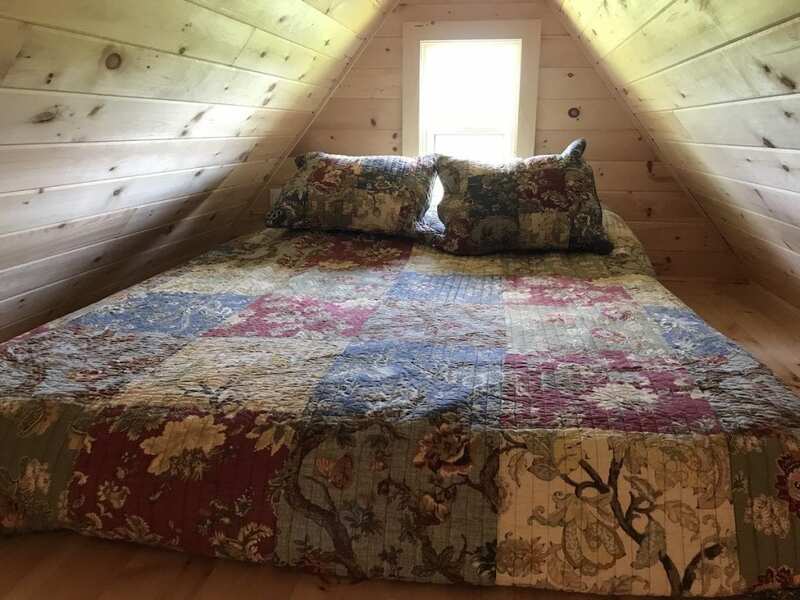 A queen mattress and quaint country bedding in the loft of “Haven in the Meadow”. 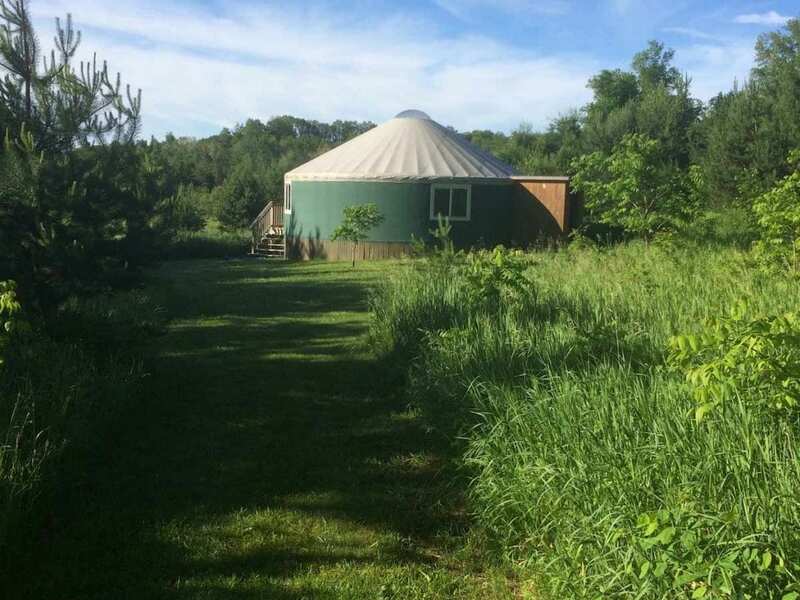 A fabulous spacious 30 foot diameter yurt. 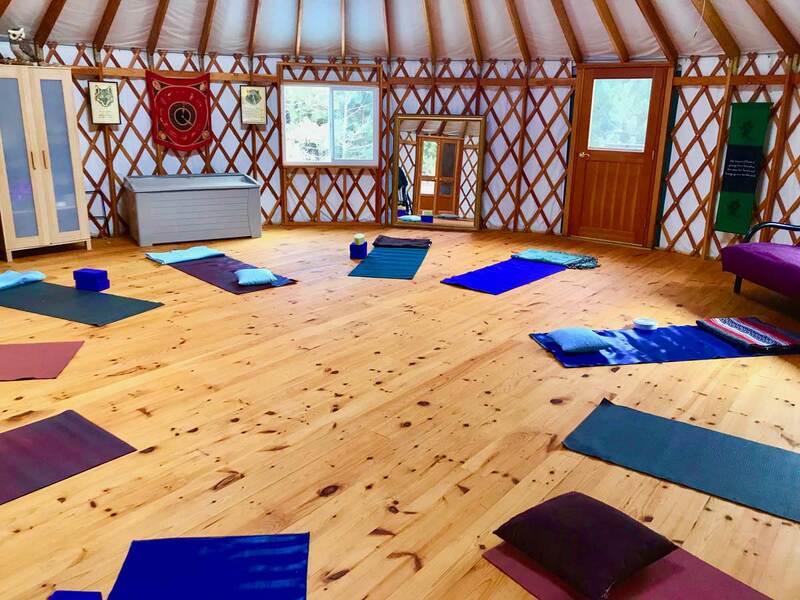 Welcome to the Yurt - a place to nourish your body, heart and soul. Ready for Yoga in the yurt. Access to 10 yoga mats, cushions, blankets or bring your own. Access to 20 back-jacks and/or 20 chairs ready for use in circle/council. The yurt and all buildings at Fells Meadows are adorned with exquisite treasures from various cultures around the world. 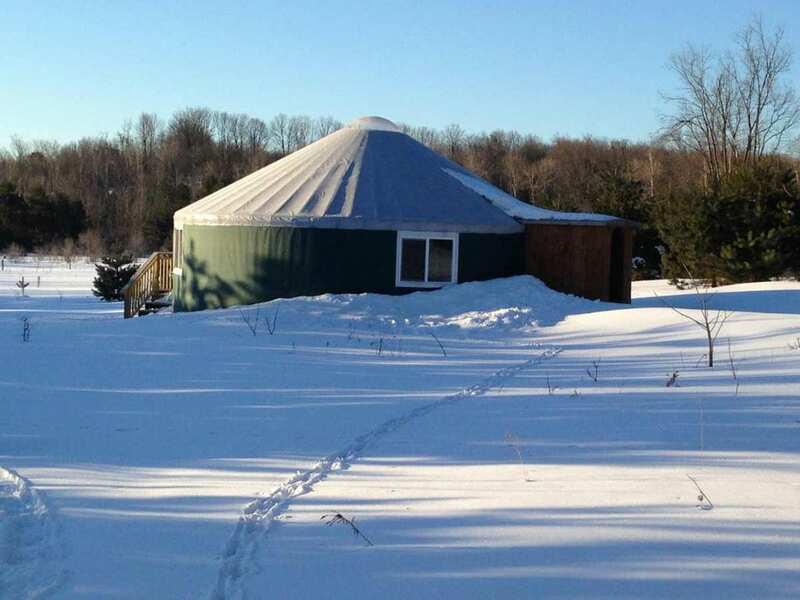 Wintertime at the Yurt - heated by a propane stove. The “Sacred Truth Tree” in the valley. 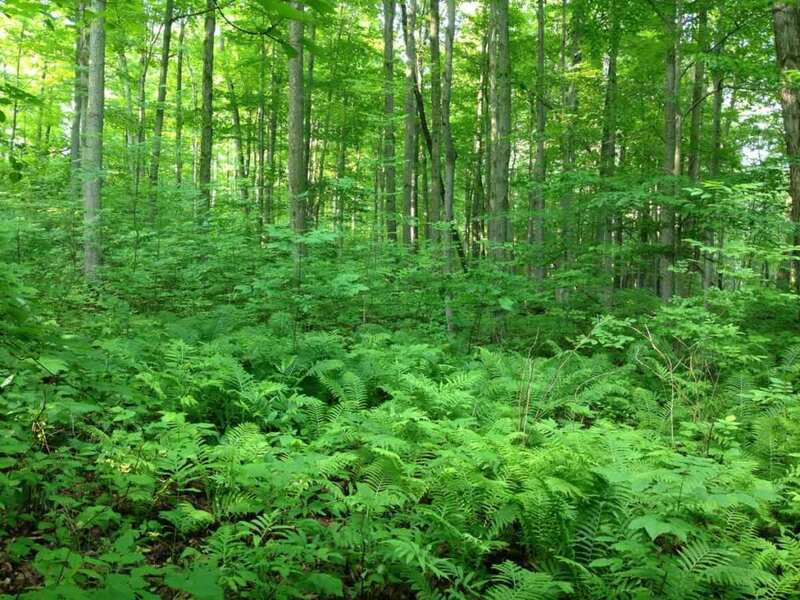 The lush forest in midsummer. 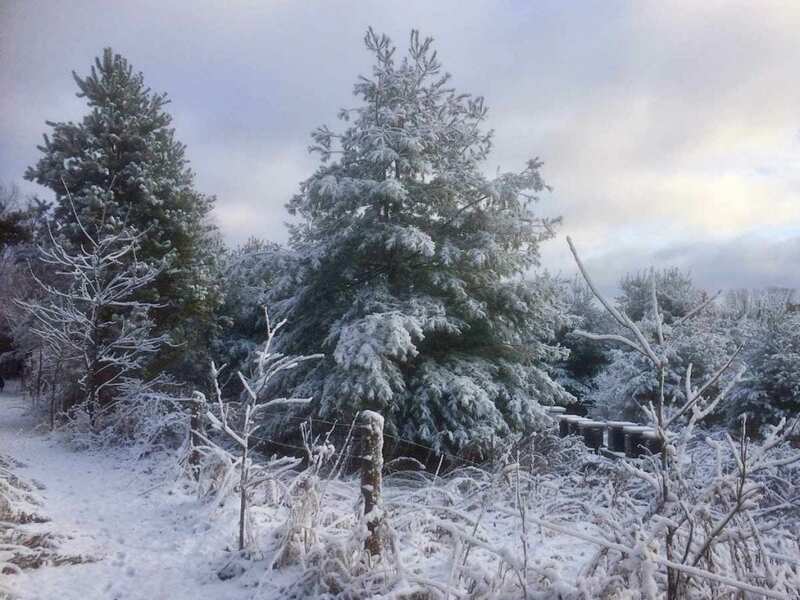 Winter magic - trails for snowshoeing, cross-country skiing or walking. 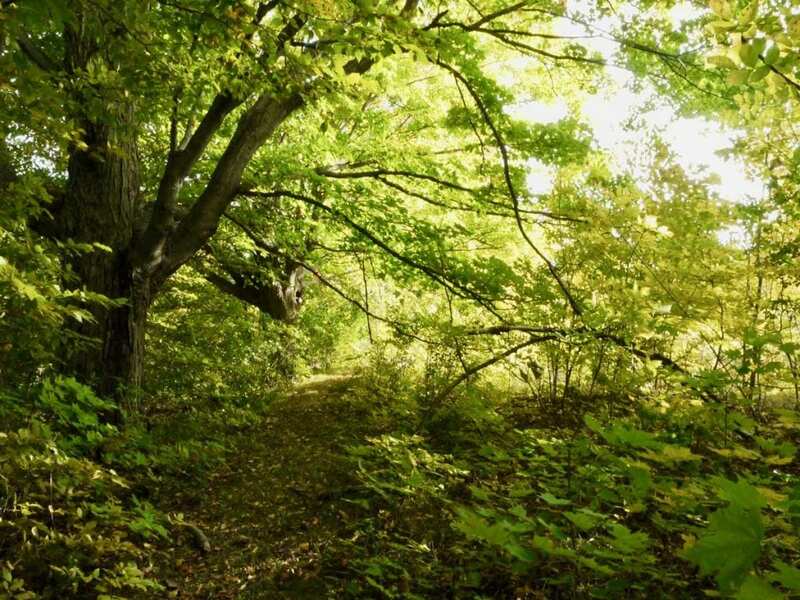 One of many paths through the forest. 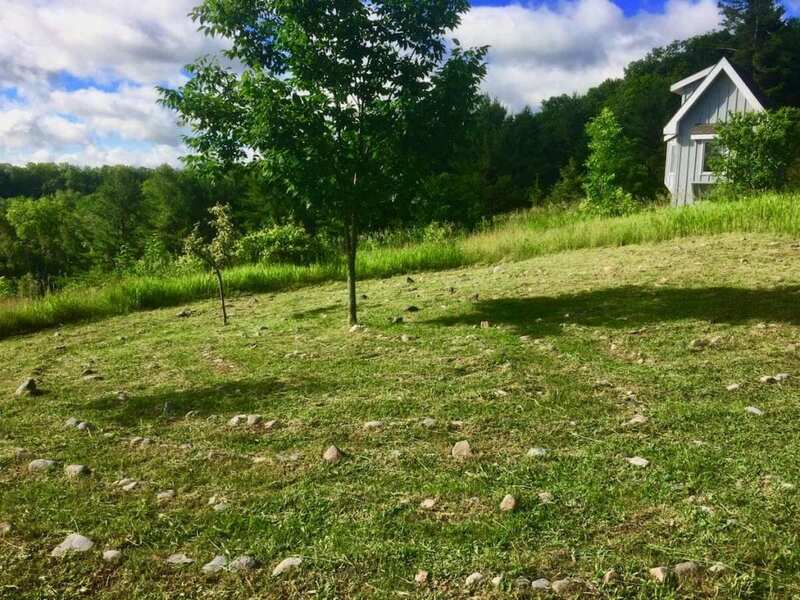 The labyrinth overlooks the valleys and hills of Northumberland Hills. The wetlands in the south east is a cherished place for wildlife. 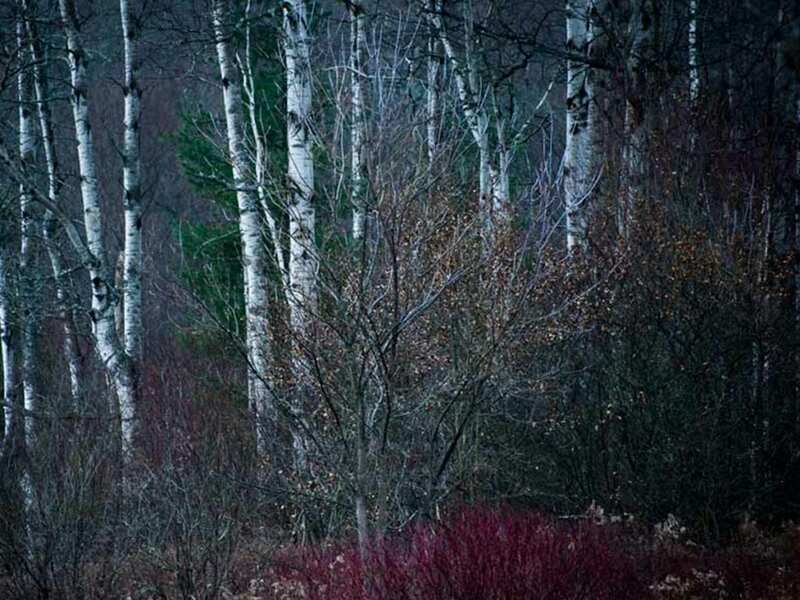 The magnificent birches in autumn. Sunny summer day on the trail. 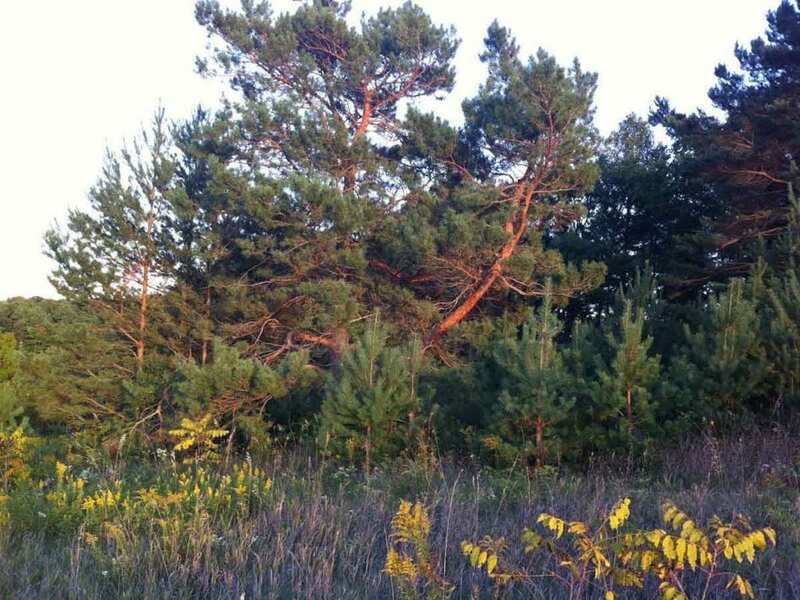 Red pines alight with the afternoon sun. 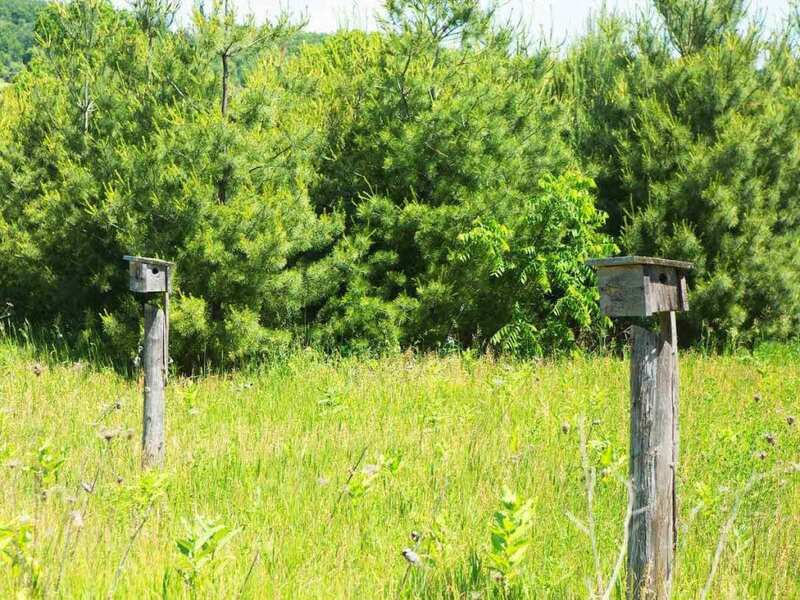 Homes throughout the property for the blue birds and other species. 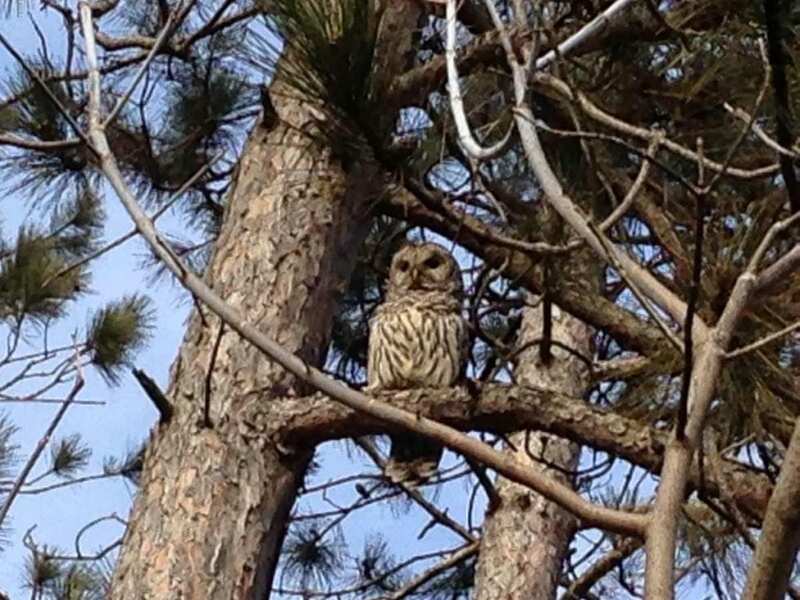 The owl keeping an eye on the lands. 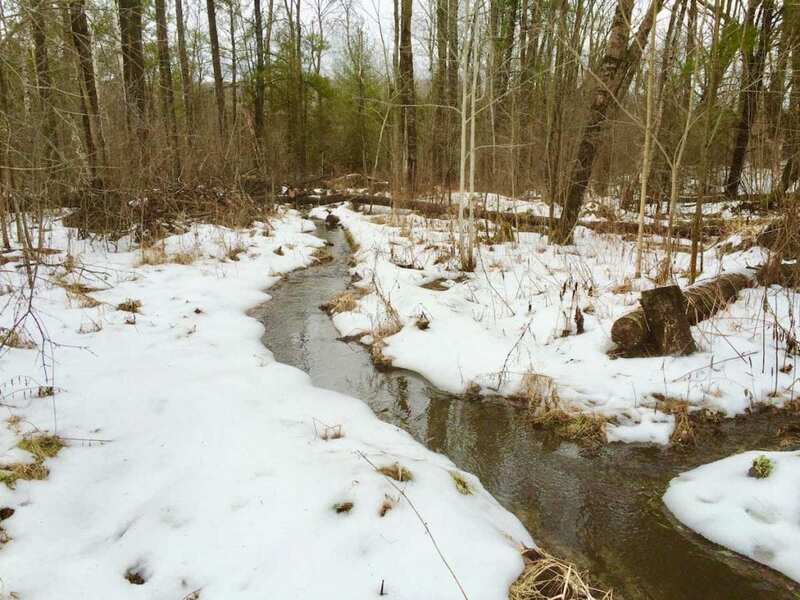 The stream mid-way through the forest. 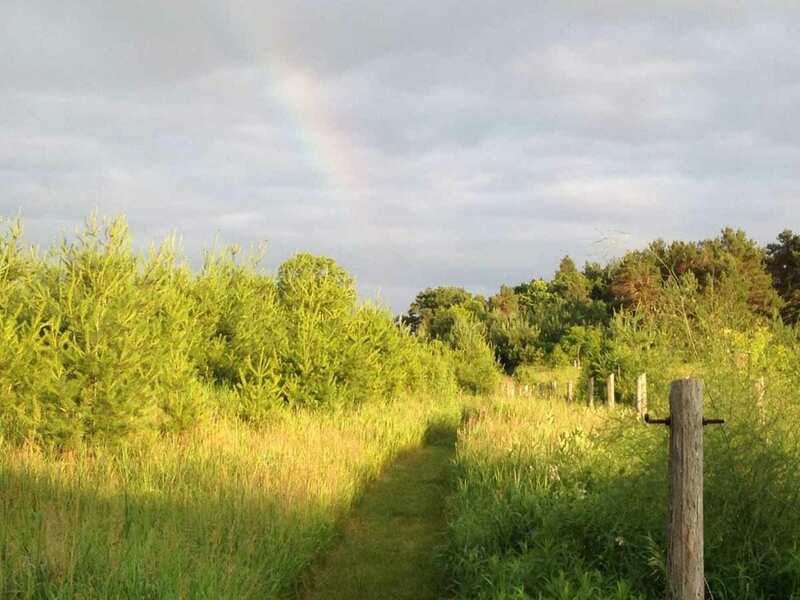 A rainbow over the trail leading from the farm house to meadows and forests. 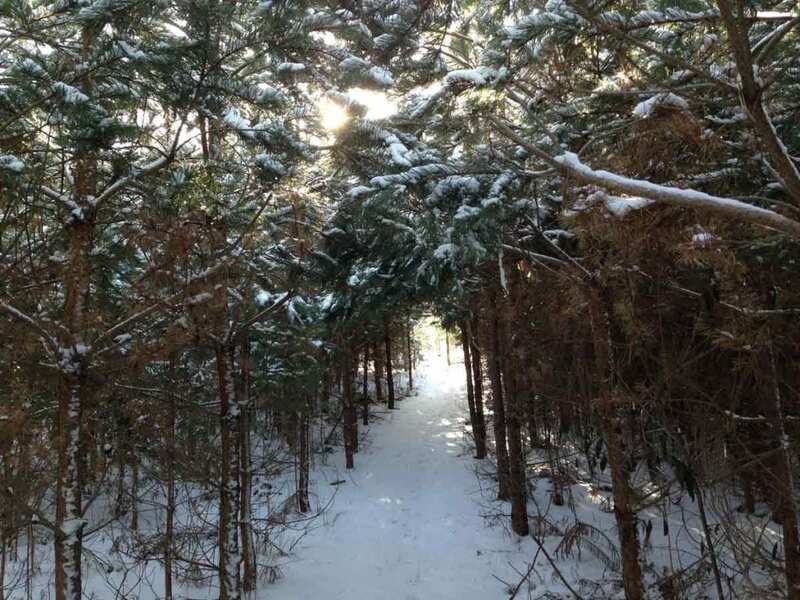 The winter path through the pine forest. 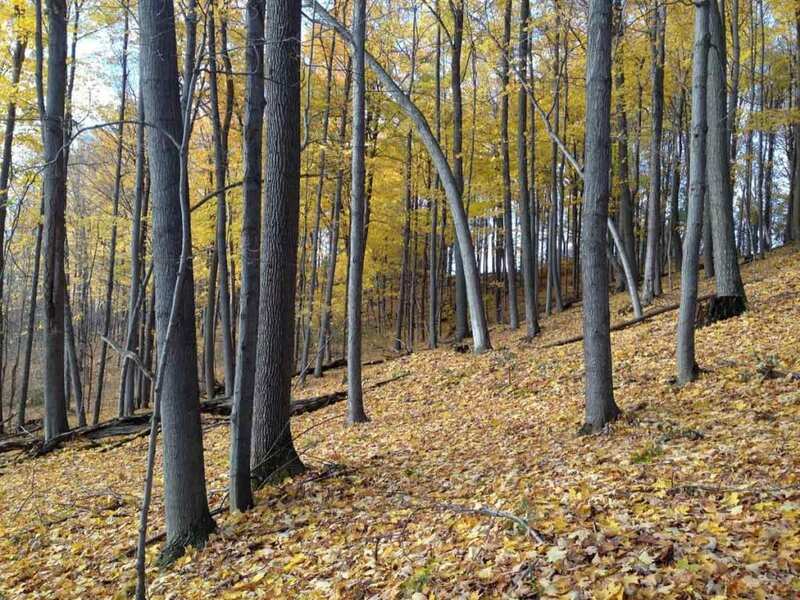 Autumn makes a carpet of leaves and seeds in the forest. The Black Walnut Trail on the way to the Yurt and the Haven in the Meadow.